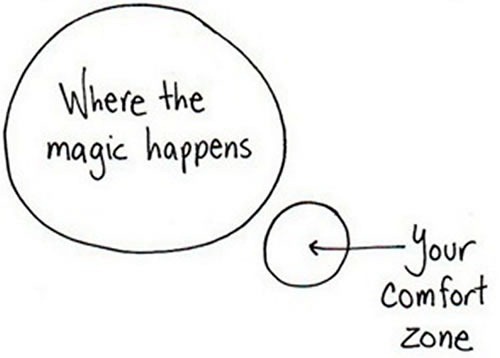 Sounds like an oxymoron but, of course, if we want to grow, we need to get used to being outside our comfort zone. The thing is, our modern lives are all about ease and instant gratification. We don’t like the discomfort of a slow Internet connection, much less voluntarily exposing ourselves to potential rejection or failure. But that’s not where the magic – the growth, the learning – happens. So be careful of the trap of making discomfort wrong. Your ability to stay with being uncomfortable, instead of avoiding it, is one of the most essential skills for success. First, recognize how your mind tries to talk you out of discomfort. Listen for the subvocalizations, that little voice that pops up when you even start thinking about venturing outside your comfort zone. Ah, ah, ah. Be on the lookout for those seemingly logical rationalizations. Your ego knows you well. Don’t fall for its clever tricks. Keep in mind, if you’re kicking it up a notch in your high-intensity interval training or preparing for an important negotiation, your alert system may very well perceive it as a survival threat and kick into “fight or flight” mode. It’ll do its best to make things uncomfortable — pounding heart, sweaty palms — and convince you that annihilation is imminent. Again, don’t fall for it. 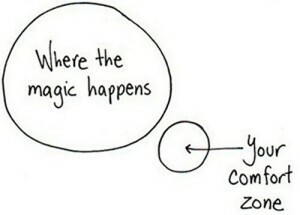 Practice staying in that place of discomfort and watch your comfort zone grow.